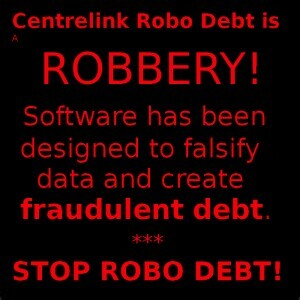 Stop Centrelink Robo Debt Now! 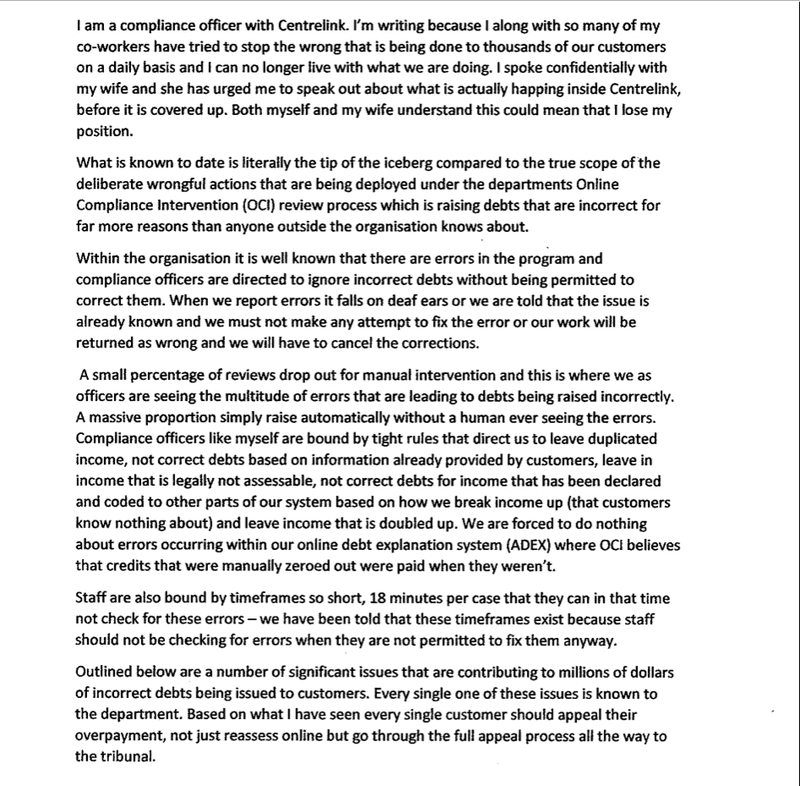 Much has been written about the Centrelink robo debt system, but virtually nobody relies on the statement of the anonymous Centrelink whistleblower for information. This discussion is based on nothing else, and comes to a very different understanding of what is going on. 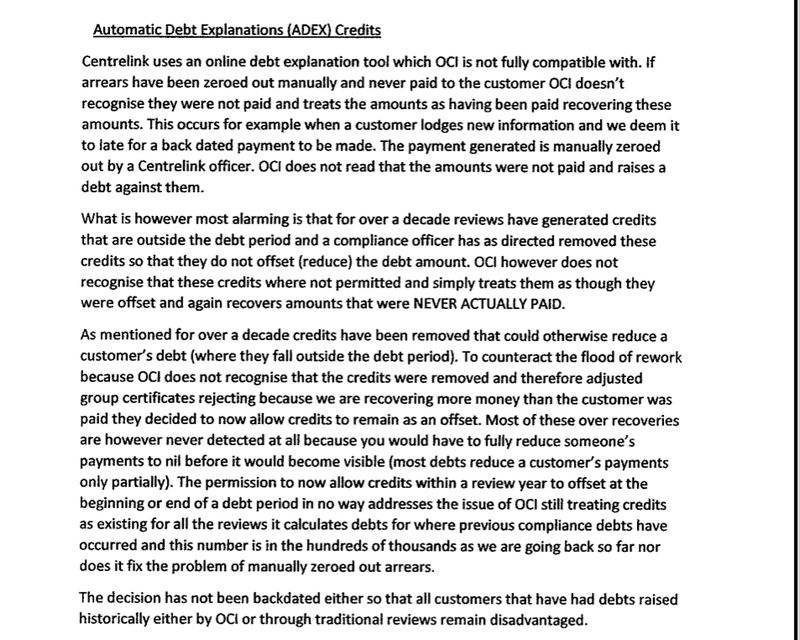 There is clearly dissatisfaction about the Online Compliance Intervention (OCI) which is supposed to find “over-payments” to Centrelink customers. While the government is perfectly happy with the system, many feel it is very distressing and heavy-handed. Some think there are problems with the software itself. It is seen as a flawed system. (1) So what can be done? There are plans to launch a class action to recover funds from Centrelink, and there is some useful information posted by GetUp at https://fraudstop.com.au/. However class actions can be in the courts for a long time. Further, individuals who wish to challenge their assessment in the Administrative Appeals Tribunal may need the kind of money Centrelink clients do not normally possess. But there is another reason a class action or making an Administrative Appeal will not be enough. No class action can raise the central legal issue raised by the OCI process itself. The OCI process is illegal. Further Centrelink is acting beyond their powers and failing to afford due process. The only thing which will actually stop Centrelink in its tracks is a Judicial Review. 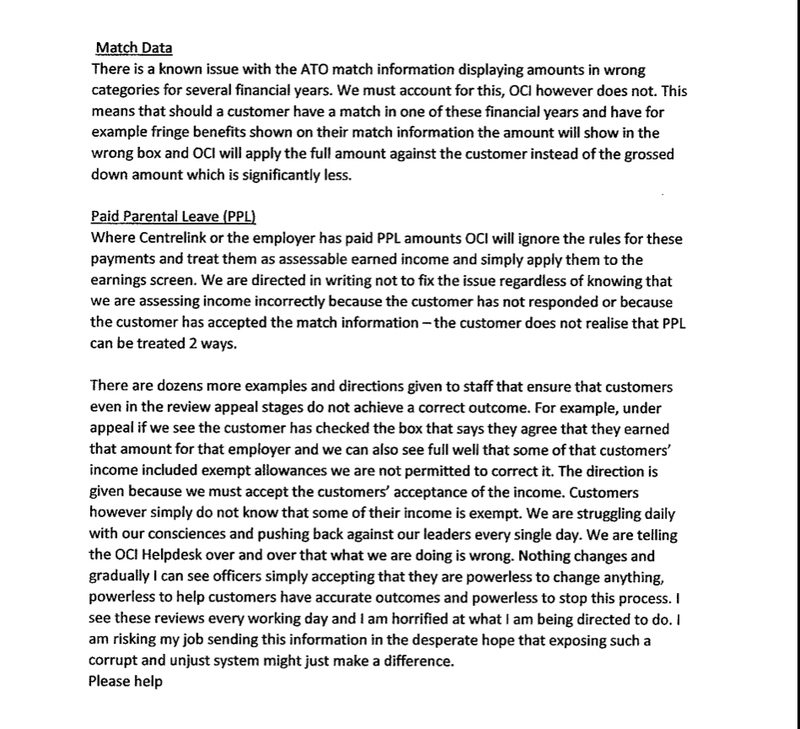 Such a Review could get an injunction to stop Centrelink's actions or even overturn the decision to use their flawed software and demand all money collected be paid back. 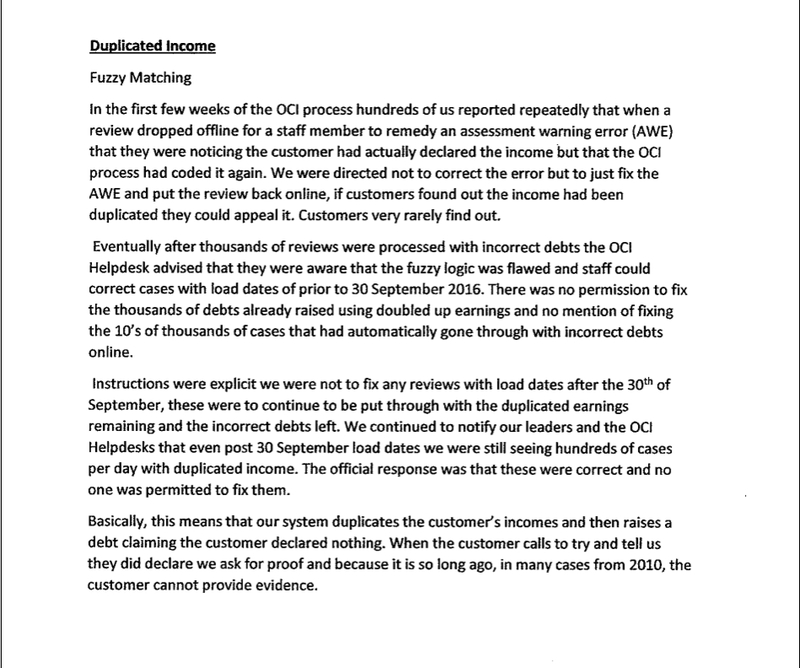 The OCI system DUPLICATES THE CUSTOMERS RECORDED INCOME. 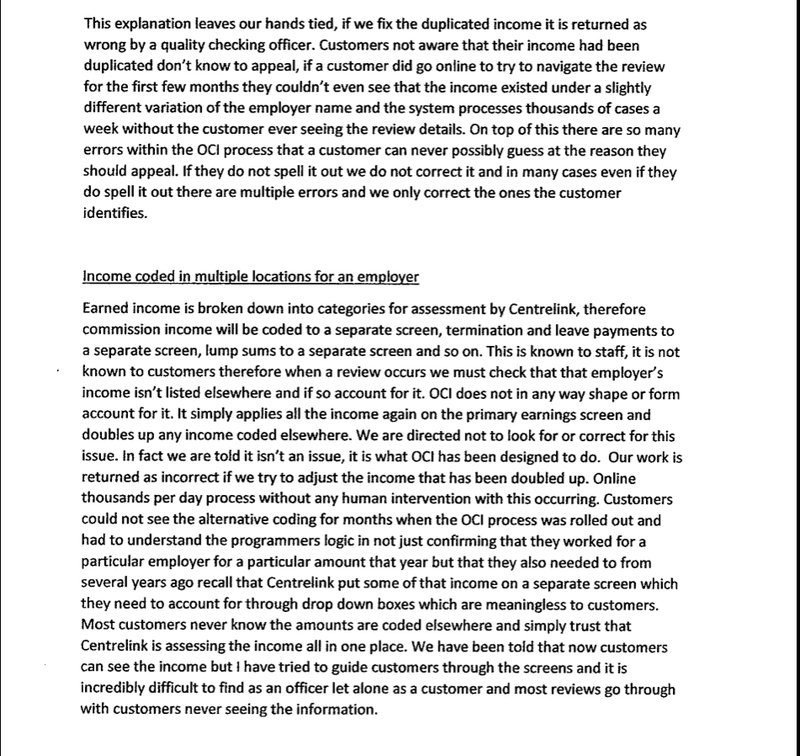 The whistleblower writes: “Our system duplicates customer's incomes and then raises a debt claiming the customer declared nothing." It is hard to see this as anything other than FRAUD. If any private company or bank tried to raise money from their customers by deliberately adjusting recorded information, the revelation of such malpractice should see them dragged into court for criminal prosecution. How is it that a government's illegal actions can remain unchallenged? Is this government above the laws which the rest of us must obey? This must stop! Which law will they choose to ignore next? 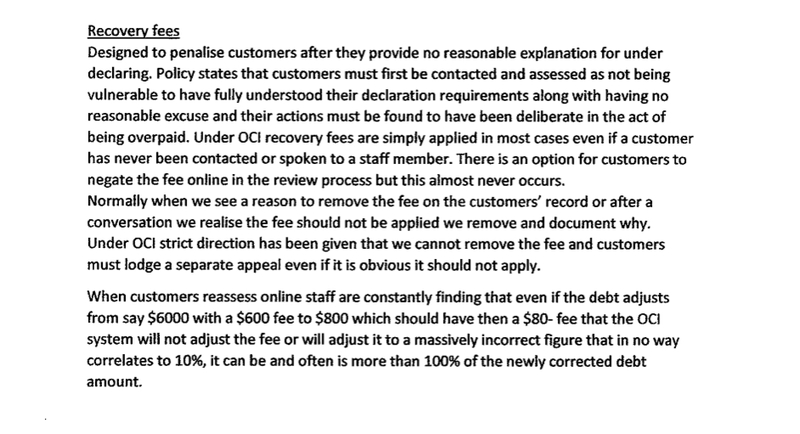 To make a successful appeal, customers must have a full understanding of the complex way Centrelink records information. Since almost nobody except experienced officers understand exactly how the system works, customers are forced to lodge their appeal in the same way we play pin-the-tail-on-the-donkey, with our eyes closed. 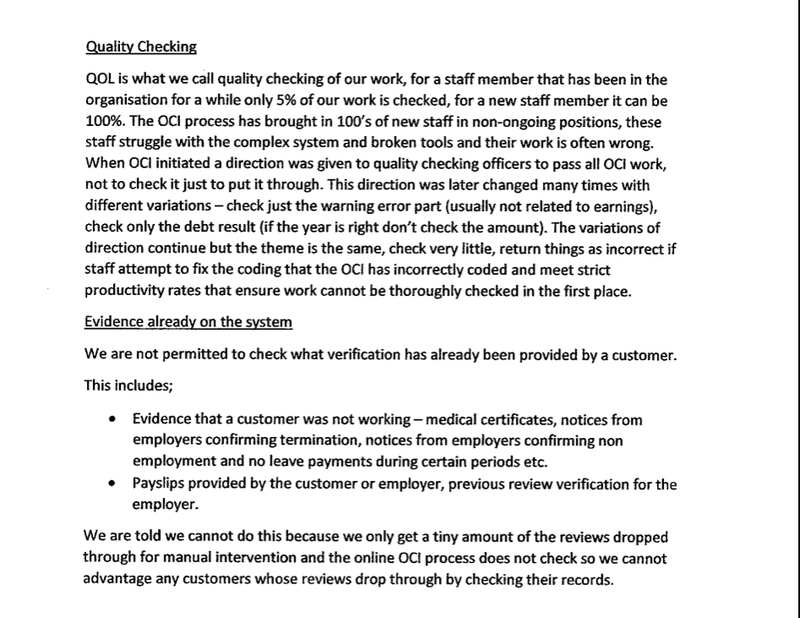 The whistleblower writes: "There are so many errors within the OCI process that a customer can never possibly guess at the reason they should appeal. If they do not spell it out we do not correct it and in many cases even if they do spell it out there are multiple errors and we only correct the ones the customer identifies." The whistleblower is explicitly states that it is impossible for officers to themselves change the OCI results for customers. "Within the organisation it is well known that there are errors in the program and compliance officers are directed to ignore incorrect debts without being permitted to correct them. When we report errors it falls on deaf ears or we are told that the issue already known and we must not make an attempt to fix the error or our work will be returned as wrong and we will have to cancel the corrections." 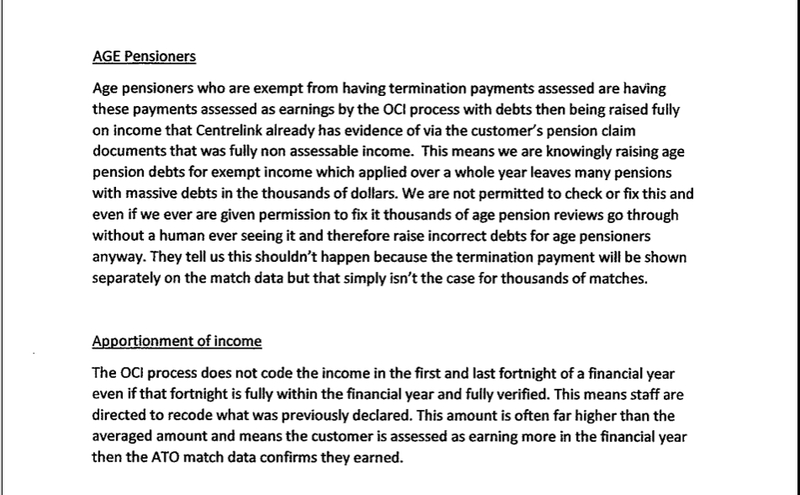 1) A software program which would guarantee that a debt is generated for virtually every Centrelink customer. 2) Since none of the clients would understand the system well enough to lodge an adequate appeal, anyone who did appeal would still be forced to pay something back into the system. Further, since many decent, law-abiding citizens would instinctively trust the government and Centrelink calculations (made by A COMUPTER after all) most would not even bother to appeal. 3) Clearly part of the plan was to make sure that long-time Centrelink employees were forbidden to correct the obvious (to them) mistakes. Surely fear of dismissal or criminal charges would stop them from telling anybody about this well planned scam. This is not a simple party-political issue. Even Liberal and National Party voters should realize that no government of whatever party should be allowed to break the law just to squeeze a little more money from those people who can least afford to pay. If they can get away with this, who is going to be squeezed next? Obviously it would be the people with more money, like themselves.